Find yourself writing notes on scrap pieces of paper all the time? TaskMerlin is like an electronic version of a scrap piece of paper. Every time you want to write something down, pop it straight into TaskMerlin instead of on that paper you're bound to lose. Putting information into TaskMerlin is simple and takes seconds. 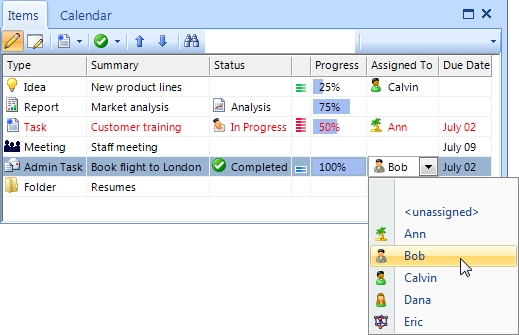 Click the button on the Item Grid toolbar to create a new task in the Grid. Now write a description in the summary line and you're done! While you can choose to set attributes such as the priority or due date, you don't have to enter anything else if you don't want to. That's what makes TaskMerlin so easy!